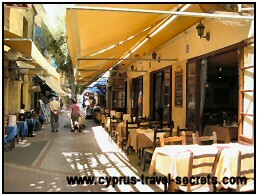 I was wondering if there would be excursions to Nicosia from Paphos in November. If so how much do they cost, can it be done in a day? Or would it be just as easy to drive? As I would love to visit this fascinating city. Any info would be appreciated. TAXI: Go for one of the "service" taxis which group individuals together rather than having to pay for a taxi yourself. These are low cost, around €12-15 euros though prices may have changed in the last few months due to fuel increases. You can book through your hotel or check with tourist information when you get here. CAR: Most flexible option though it will cost a bit more but car hire is cheap in November as low season. It's not hard to park in Nicosia. Just get a copy of the city centre map and head for the walled section. There are car parks all around the ancient walls and then you are only a few minutes walk from the centre. You also have the option of walking across the border in the North via Ledra Street - you will need your passport and you just get a piece of paper stamped (not your passport) to cross and shop on the Turkish side. Enjoy and do post your experiences and photos on the site!